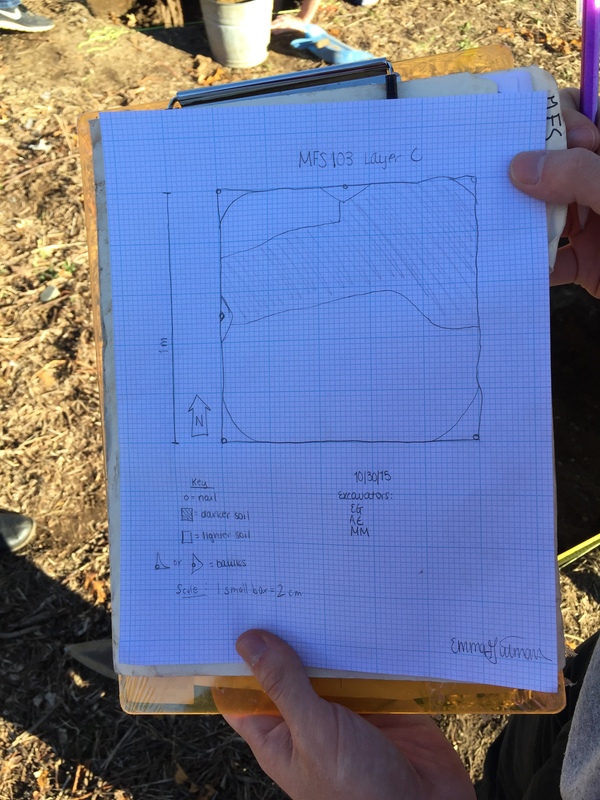 This week’s update on the progress of excavation group four comes courtesy of ANTH60a student, Emma Gutman. Emma is a Brandeis University undergraduate student majoring in History and Anthropology. Mother Nature graced the McGrath Farm Site with some beautiful weather this Friday, although we arrived at the site not anticipating the previous week’s rain. A collective groan was heard from all three groups excavating Operation 1, as we approached our units to find our tarps sunken into our units under a considerable amount of water. 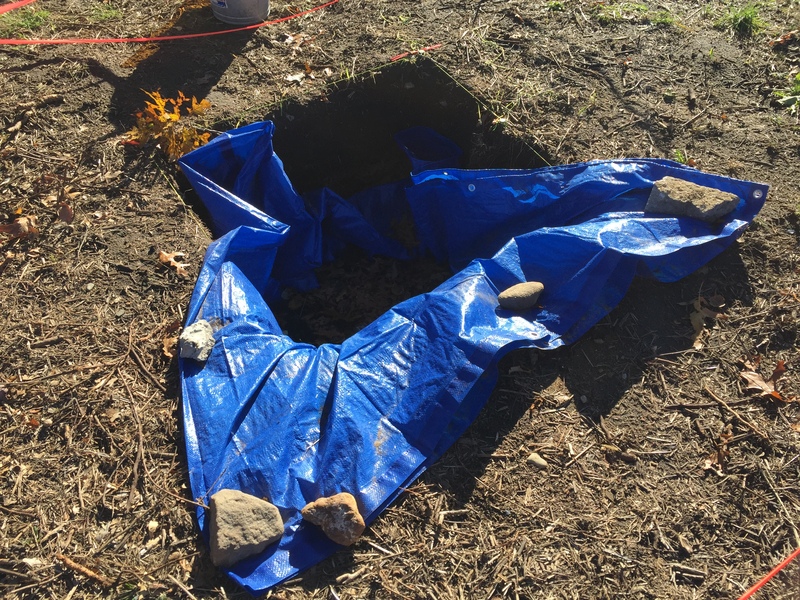 My group fared decently well, and with some careful tarp-maneuvering, we drained the water without damaging the unit. Our first order of business was to clean the unit floor in preparation for a plan drawing. To update you since group 4’s last post, we have been working on excavating our expanded unit down to level 103C, the depth of our original 50x50cm unit in the northwest corner. In reevaluating stratigraphy in the side walls, we realized that we had probably dug a bit too far. Level 103C actually started a few centimeters higher than we anticipated. After adjusting our notes and measurements accordingly, we continued to dig and even out the bottom of the unit. We ended class last Friday with an even-bottomed unit featuring a strange stripe of dark soil through more orangey subsoil. Even stranger, we were finding A LOT of plastic, which was surprising and honestly a bit disappointing at the depth we had reached. This led us to believe that our unit could have been the location of some sort of more modern garden or pipe, not quite as exciting as Andrew’s projection of a fireplace or furnace in his prior blog post. There was an interesting trend of the plastic being more concentrated in the darker soil, whereas the orangey soil was host to more worms and roots. It was this color disparity that we hoped to capture in a plan drawing. Flash forward to this week, and suddenly the lines between the darker and lighter soil were not so distinct. Regardless, we went forward with depicting our unit in a plan drawing in order to distinguish our possible feature/area of darker soil. While troweling to clean the level down to this point, we encountered many rocks. We decided to declare a new level—103D—based on the texture-change. Accordingly, we took all our elevations and performed Munsell tests on both the orangey subsoil and the darker soil of the potential feature. The soils seemed quite similar in all aspects except color. 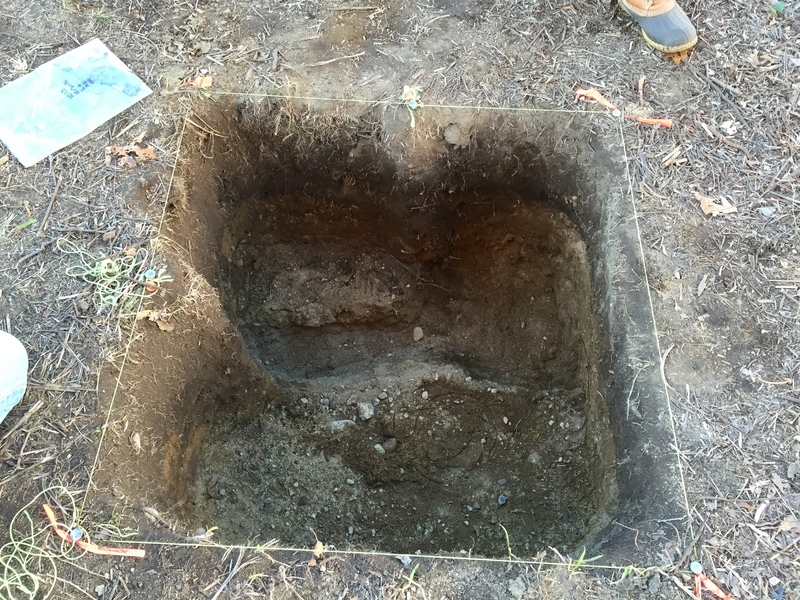 Professor Parno’s prediction that this feature wasn’t anything particularly remarkable then led us to dig out the darker soil portion and see how long it would last until we got to sandier subsoil. This process brought us about 20 centimeters deeper into the unit and brought along the discoveries of yet more plastic, a small chunk of ceramic (seemingly a terra cotta flower pot), and some small bits of burnt wood/possible charcoal. Ultimately, we think the difference in color was probably due to some sort of garden on the site that required piping or tubing (hence the plastic) or a large tree root that may have been burnt. Going forward, we will dig through the remaining subsoil and may be able to declare the unit closed if we don’t encounter any more artifacts in the process.